Beyond Eastgate Winchester Hants - The gate has long gone. It would have been a fortified construction like the Westgate. Nowadays it is The Broadway, a wide pleasant street filtering the traffic in and out of the city. Past the roundabout the name reverts to High Street although some maps call it Bridge Street. Quite a busy street and it always has been for it is one of the main entries into the city. The Broadway has seen great men and women of many eras, soldiers of many kings, merchants coming in and out, farmers bringing in their goods to sell. Today cars, buses, coaches and lorries go round the statue of the city's greatest king. 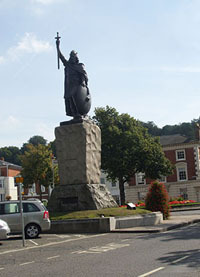 King Alfred dominates The Broadway, surveying his city, his sword arm held high. The statue looks very old but in fact was erected only in 1899, the thousandth anniversary of the King's death, by the citizens of Winchester. They considered King Alfred to be their greatest statesman and he was. The scupltor was Sir William Hamo Thornycroft R.A. 1850-1925, son and grandson of other famous sculptors. Sir William also designed many London statues including that of Cromwell. 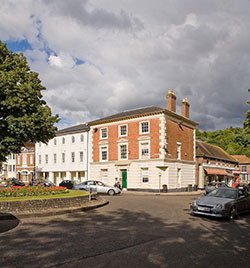 Behind and beyond Eastgate Winchester is a treasure of an area, small, busy and attractive. Walk along behind the Statue to the bridge over the river. On the left there is the City Mill. Belongs to the National Trust and is open to the public. Worth a visit. It is a working mill and you can buy the stone ground flour in the shop. Be careful if you have to cross, this may only be a B class road, but it is very busy at times!! Did it grow there? It looks as though it did!!! These days this attractive old building is a fine dining restaurant with an excellent reputation. Imagine dining among old beams and walls that have been there for centuries!! 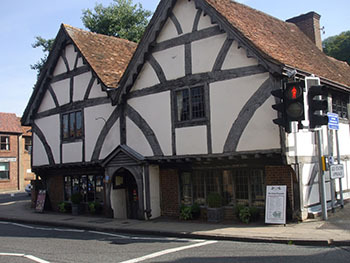 This is the oldest house in Winchester and the sign says it is dated 1450. 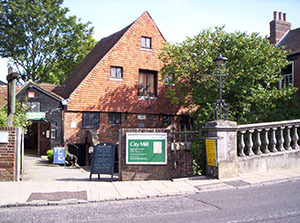 The building is another link with Queen Mary I as she gave it to the City of Winchester along with the City Mill. 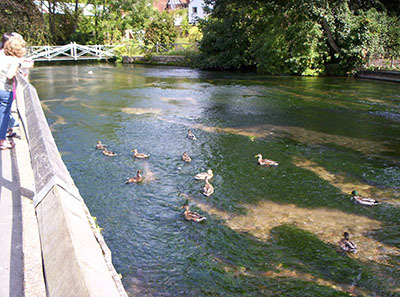 Come back towards the High Street and look over the Bridge into the lovely River Itchen. The footpath alongside ambles down to Wolvesey Castle and Bishop's Palace A very pleasant walk with the old walls on one side and the river on the other. The pretty river that runs through the city and gives so much pleasure to locals and visitors alike. 28 miles long it is an Area of Scientific Interest because of its wildlife, but should be also an area of outstanding natural beauty! The river is one of Hampshire's chalk streams famous for its trout fishing like its sister river the Test that rises at Laverstoke not far away.. Both rivers flow into Southampton Water. The Itchen rises near Cheriton a village to the east of the city. The river has several channels within the city and one of these was the cause of the flooding problems in the cathedral! The river still powers the City Mill. At one time this was a navigable river. That pub at the side of the river The Bishop on the Bridge makes a great stop for a thirst quencher or a pub meal! Above and in the southeast of the city is St Giles Hill. In 1981 parts of this this lovely spot were designated as a conservation area. Whatever time of the year you go there it is beautiful. Tree covered slopes ascend to a grassy area at the top once the site of the medieval St Giles Fair. Views both from the top and on the way are delightful. Views down to the city, viewing plaques with explanations, lots of seats in the sun and in the shade. 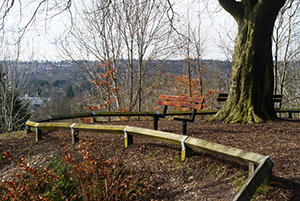 A seat on a winters day on St Giles Hill Winchester, overlooking the city. Plenty of footpaths make the area very accessible. The 100 mile South Downs Way trail to Eastbourne starts here. Apart from that there are footpaths around the hill and from the city, one has steps so is not suitable for wheelchairs or pushchairs.